US/France, 1951, 100 minutes, Black and white. Errol Flynn, Micheline Presle, Agnes Moorehead, Vincent Price, Victor Francen, Jim Gerald. 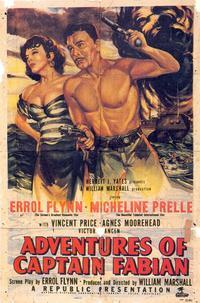 The Adventures Of Captain Fabian is entertaining enough but really an average film. Errol Flynn had reached the peak of his career in this kind of swashbuckling adventure and the present film is really only a pale imitation of the Flynn epic. It was made in France with U.S. collaboration and is of interest merely as an almost postscript to Flynn’s career. 1. The quality of this adventure film? In the '50s? Now? Appeal? 2. The film as an Errol Flynn vehicle? The fact that he wrote the screenplay, his own performance and impact? 3. The background of New Orleans, the early 19th. century? The prologue and the emphasis on pride of name and pride of blood? Reputation in the city, the moral stands and ambiguities in the city? How interesting was this background, how much taken for granted, how well explored? 4. The initial impact of the snobbery of the Winthrop’s? The effect on Leah? 5. The film's gradual focus on Leah? As not having pride of blood, as a servant, her ambitions, her relationship with Jezebel and Jezebel's influence on her, the scene of the party of the riffraff in the house? 6. The revealing of the liaison between Leah and George? George as a weak man, immoral according to the standards of the day, get thinking he was an upright man? The death of the servant and the reaction of both? George's betrayal of Leah and her attitudes of vengeance? 7. How did the film show the two combining in love, hate, murder? The effect that each had when combined with the other? The ironic contrasts in the murder of the servant, the murder of George's uncle? Their combination for violence, on one another, leading to their deaths? The moral fable tones the film took as regards these two characters? 8. The portrayal of Fabian in the light of the presentation of Leah and George? His role in the court case, establishing Leah and her restaurant? His sailing career, his attitude towards marriage, to Leah? His telling her the truth? The watch and its use in the grave? His imprisonment, the heroics for the escape and the ending? A credible character? The title of the film for him? 9. How did the film build up in the focus on George and Leah? The seduction before George's marriage, the death and burial of the uncle, the lies and the stories, love, hatred? The nature of the marriage, the house and Leah's ambitions? George using the watch? The combining of two evil persons? 10. The melodramatic climax of the arrest, the siege of the prison, the siege of the ship? Appropriate for this kind of film? 11. How much of the film was adventure, how much the atmosphere of moral fable, set in costume period?